Here at the University we have three different meal plans. Unlimited, 14 plan and 10 plan. On the Scranton Campus Dish website it shows the different types of meal plan the University offers. I have the 14 meal plan. I had this plan my Sophomore year also and it worked well. I only get food on campus for lunch and dinner. I usually make my breakfast and my definition of “make” means cereal or a breakfast bar. However! 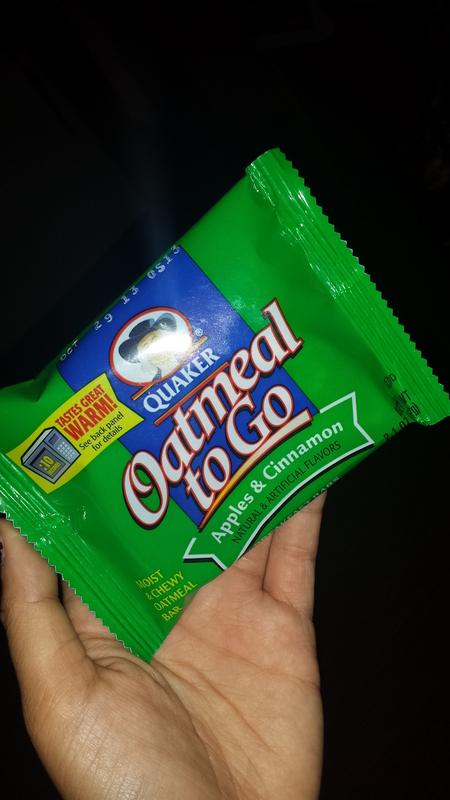 I found these amazing and delicious Quaker oatmeal bars. They are so good and filling! All you have to do is pop them in microwave and you have a fresh on the go breakfast! Breakfast with a Pulitzer Prize Winner! You are probably wondering who was speaking at this breakfast! Well we were honored to meet the Pulitzer Prize winner and author of “Almost Home“ Tina Kelley and the other author Kevin Ryan. Tina is a writer for the New York Times and Kevin is the Covenant House President. Their book is about homeless children and their experience trying to help them. They are inspirational and intelligent individuals who are spreading hope to all these children. Since my blog is all about food, I have to mention what we had for breakfast. It was a buffet, so I was tempted to eat everything but I kept my temptation under control. I had french toast that drowned in syrup, potatoes, strawberries, pineapple, and of course coffee! I love the breakfast food at my school like I mentioned in my first blog. Everything is always delicious and fresh! Coffee is one of those necessities college students adapt over time. It is probably the reason why most parents started becoming addicted to caffeine. Personally, I started drinking coffee in high school but my cravings definitely increased over the past two years being in college. Drinking coffee becomes apart of your every day habits. Coffee can be a negative toward your body. Coffee causes the body to become dehydrated so drink plenty of water with coffee or energy drink! Also keep in mind the time of the consumption of coffee because college students need about 7-8 hours of sleep which most do not get. However, drinking coffee later on during the day can cause lack of sleep. Check out this website Caffeine Craze! It includes some more facts about coffee consumption and even has an online poll. 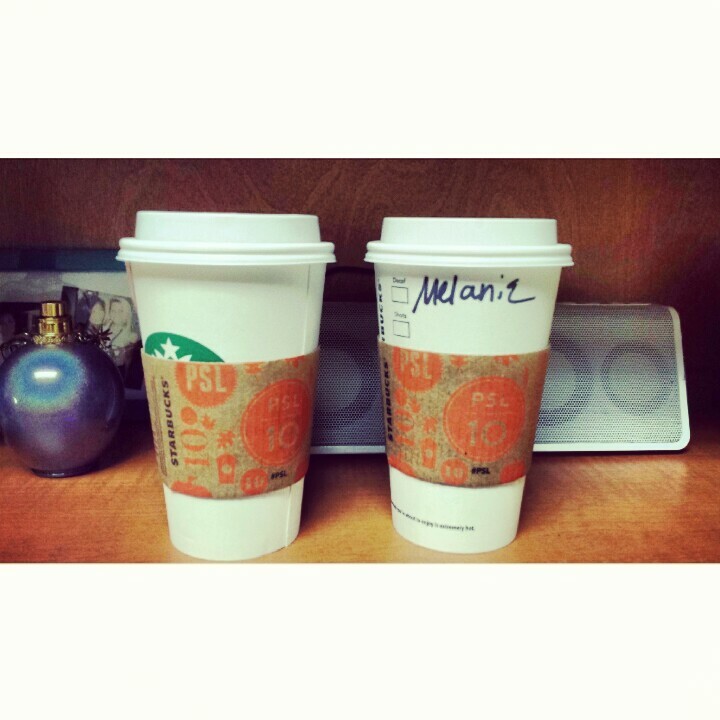 Today is Sunday and I have already made 2 trips to the Starbucks on campus. This means I’ve had about 660 mgs of caffeine today according to The Center for Science in the Public Interest Caffeine chart. Having a Starbucks on campus is a blessing because we do not have a Dunkin Donuts, but the temptation to add more caffeine is alwaysthere. I also add one or two extra shots of espressos to my drink to get me through my day but I have to start thinking about how unhealthy it is for my body. We do have another coffee shop called Java City in our library which gives us a couple of options. Another way I can satisfy my coffee needs is through my Kureig. That was one of the main things on my list of things for college when I was an incoming Freshman two years ago and I still use it daily. My roommates love using it too! For all the Starbucks lovers like myself, check out Starbucks Secret Menu! Every Starbucks has a secret menu but they do not advertise it. The Caramel Snicker doodle Macchiato is absolutely delicious! I really want to try their Skinny Mint Tea and the Banana Split Frappicino. I am obsessed with Mexican food. When I get a craving for it, it must be my next meal! Whether I go out to eat or make it myself. My favorite Mexican dish is a tie between quesadillas and tacos. Scranton has a variety of choices. Some nights they offer Mexican style food upstairs in the cafeteria. 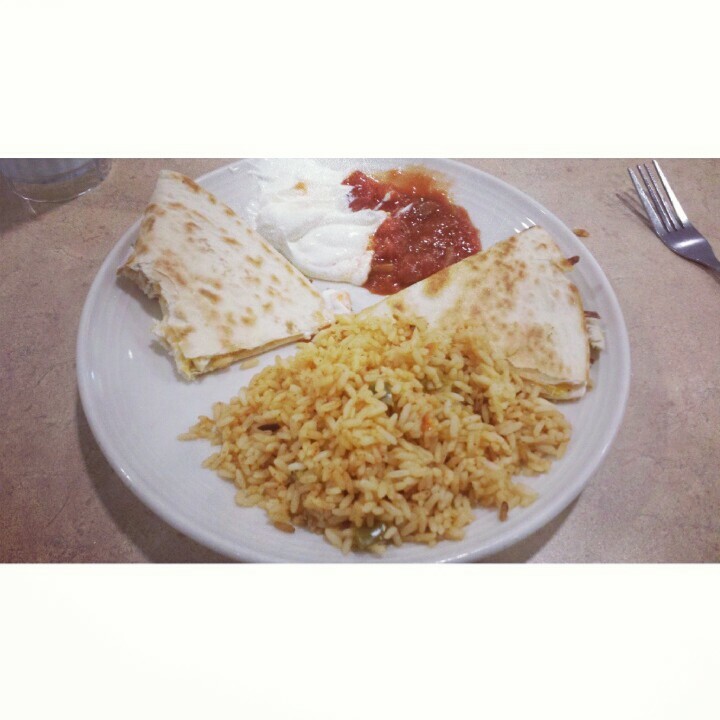 Today I had the chicken and cheese quesadillas with rice! 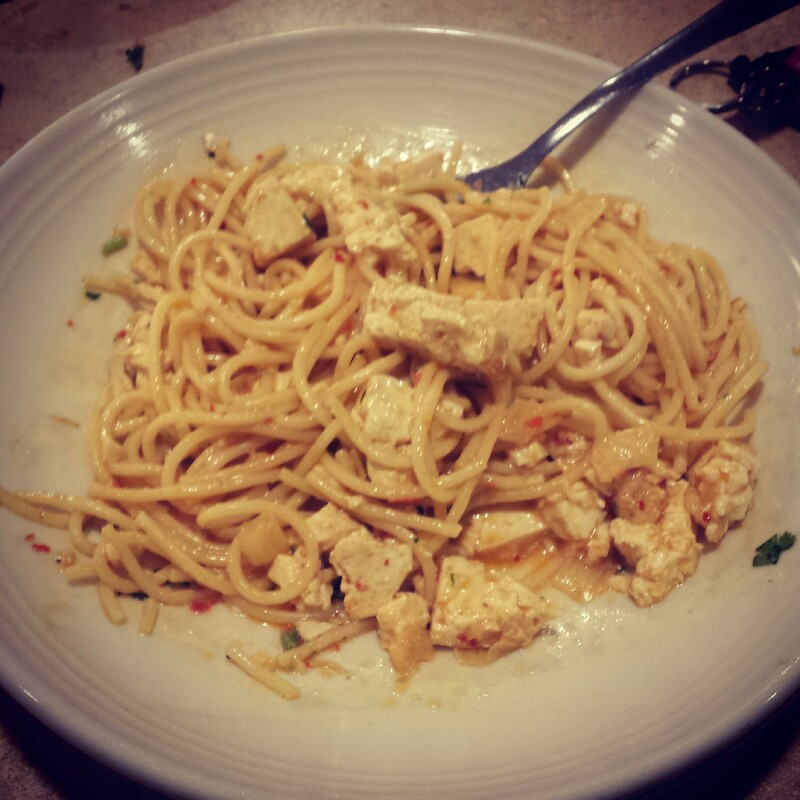 It is so good and they portion the food so you get a decent meal but you are not too stuffed. Scranton has a website I use daily called Campus Dish, here you can see what the cafeteria has for breakfast, lunch, and dinner before making the trip to the third floor! But if it is not on the menu for the day there is always the choice of going to Zocas which is downstairs by our fast food section. Zocas Fresh Mexican Fare has quesadillas, tacos, taco salads, and burritos. My favorite is the burritos from Zocas. I usually get chicken, rice, cilantro, cheese and tomatoes. I love using my fitness pal and they also have it online! You can look up how many calories different meals are and they track how many calories you consume. Surprisingly they have Zocas on my fitness pal. I have eaten my fill of Mexican food the past couple of days. I went home for the weekend in New Jersey and on my last night there my mom and I went to my favorite Mexican restaurant in my town, Don Chuchos. They have the best salad bowl where the bowl is edible! It is made out of a breaded shell that you can dip and eat your salad with. The atmosphere there is always friendly and most of the workers there know my family. I love salad bars. 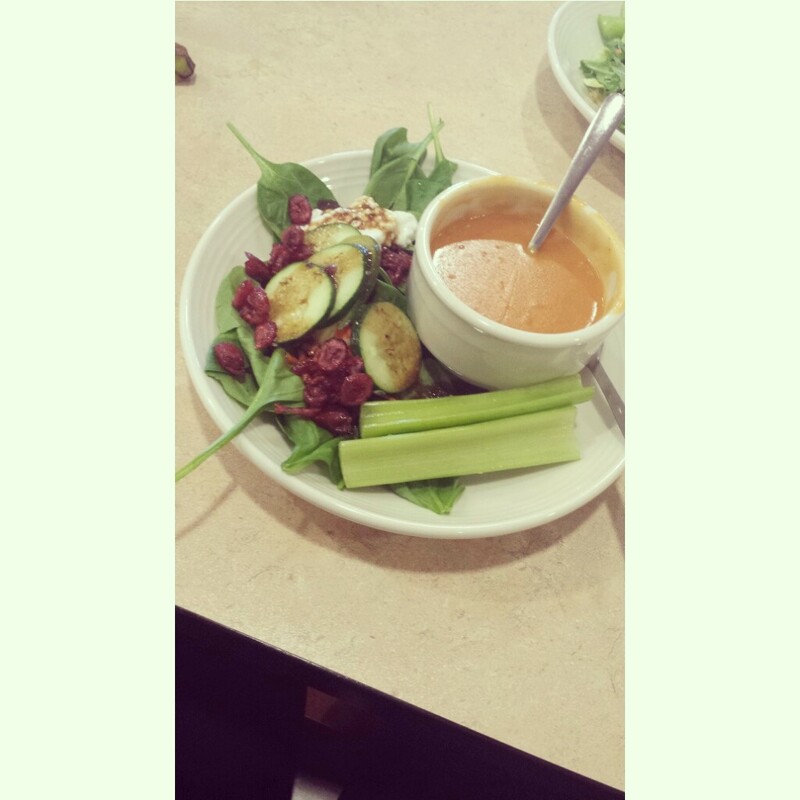 Not only can you see exactly what you are adding to your meal but it is a healthy and fun choice. Today I had a salad with spinach leaves, cucumbers, feta cheese, two pieces of celery and craisins topped with balsamic vinegar. On the side I had tomato rice soup. A very vegan lunch once again, but don’t worry I will have some chicken for dinner tonight! Don’t know what craisins are? Craisins are dried cranberries, just like raisins except they are cranberry! I love craisins as a little snack. They go great with almonds and or on your salads. 1/4 cups of craisins are only 130 calories. One serving of craisins meet 25% of your daily fruit needs. They are also fat free and cholesterol free which is awesome. At the University, healthy eating is your choice and the school does encourage it’s students to eat healthy but they cannot force people to do anything. It’s the students choice whether they want to get into the salad line or the Chick-Fil-A line (which I do every once in a while). Chick-Fil-A actully has a nutrition tracker which has the entire menu online and it shows what you are eating and all the facts you need. I love having a variety of different foods to eat because if you eat the same thing everyday you can get bored with what you are eating. My favorite salad to make at home is spinach leaves with strawberries, grilled chicken, cottage cheese, cucumbers, tomatoes with poppy seed dressing on top. It is a summer dish but all the ingredients are available all year long. I think it is a refreshing meal and it has so many good things about it. I found a delicious looking recipe on Lauren’s Latest Blog which is a little different from mine. Instead of chicken this says to use bacon which sounds absolutely amazing.